To access this page, in the PROJECT section of the ADMIN module, on the list the shows the available groups of settings, click PROJECT DETAILS. On this page, you can manage project settings such as the name of the project and others, or you can delete the project. Note: If you are not the project owner, you can request ownership. To do this, next to the name of the current project owner, click Request ownership and then, click REQUEST. The project owner is notified and can start the ownership transfer process. 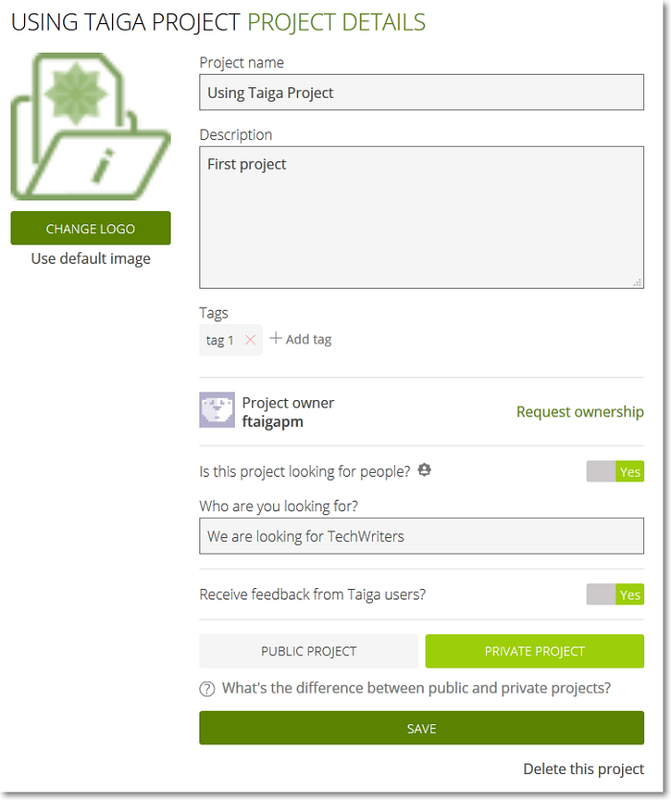 Note: Projects that are PUBLIC can be found by anyone on Taiga‘s Discover page or via online search engines and can be accessed by non-members. To set up the level of access for non-members, you can manage the permissions for the EXTERNAL USER role – for more details, you can go to The Permissions section. To save any changes you make, scroll down to the bottom of the page and then click SAVE. To permanently delete the current project, scroll down to the bottom of the page, click Delete this project and then confirm your action.